Assisted by the play-making ability of Lache Seastrunk, the Baylor Bears led the nation in scoring, averaging 53.3 points per game. If George O’Leary’s team follows a similar blueprint, it will put added pressure on the Knights’ secondary that has been tested multiple times this season — allowing at least 250 yards through the air against star freshman quarterback Christian Hackenburg (Penn State), All-America candidate Teddy Bridgewater (Louisville) and South Carolina coach Steve Spurrier’s best signal-caller since his Florida days, Connor Shaw. Even Memphis moved the ball in the passing game against the Knights. That can not happen here. The Bears will move the ball and get their points, but the Knights need to find success against the run and limit (as best as possible) Petty and his speedy receiving corps. The realistic goal here is to remain within striking distance offensively, one that will not come to fruition if the Bears control the time of possession and torch the UCF defensive backs. The Big 12 champions have been picked apart at times through the air, allowing 440 yards passing and three scores in their lone loss of the season, so there’s room for UCF quarterback Blake Bortles to make a difference here. But the Knights’ success against one of the most explosive offenses will depend on their rushing attack, notably talented junior running back Storm Johnson. Johnson, a Miami transfer in his second season playing in Orlando, enjoyed his best collegiate season in 2013, but tapered off down the stretch as the Knights fought for their BCS lives in close wins against South Florida and SMU. Johnson carried the ball just 21 times total in those games, but they’ll need to rely on him much more against Baylor in an effort to keep the Bears offense off the field. In the team’s two best wins this season (Penn State, Louisville), Johnson eclipsed the 100-yard mark and found pay dirt. Overall, the 6-foot Loganville, Ga., native has 1,015 rushing yards and 14 total touchdowns. If UCF is going to take down the heavy Fiesta Bowl favorites, Johnson will need to log 25 touches (he’s a capable receiver as well) in the game. 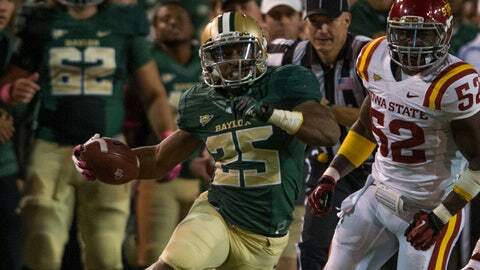 53.3: In coach Art Briles’ balanced, uptempo offense, the Bears led the nation in scoring with 53.3 points per game. Its the third straight season Baylor has ranked in the top-five nationally in scoring. Only Oregon can say the same. The last time such a highly-productive offense was derailed in a BCS bowl game (including title games), the Oregon Ducks were stifled by the Auburn Tigers in the 2010 BCS Championship game. Auburn won the time of possession thanks in part to Cam Newton’s efficient running abilities, forced two turnovers and held Chip Kelly’s to 5-of-15 on third downs. In the 10 BCS games since that surprisingly low-scoring result, top-10 scoring offenses have held court: 2011 Oregon and Oklahoma State averaged 40.5 points in their respective games; 2012 Oregon and Florida State averaged 33.